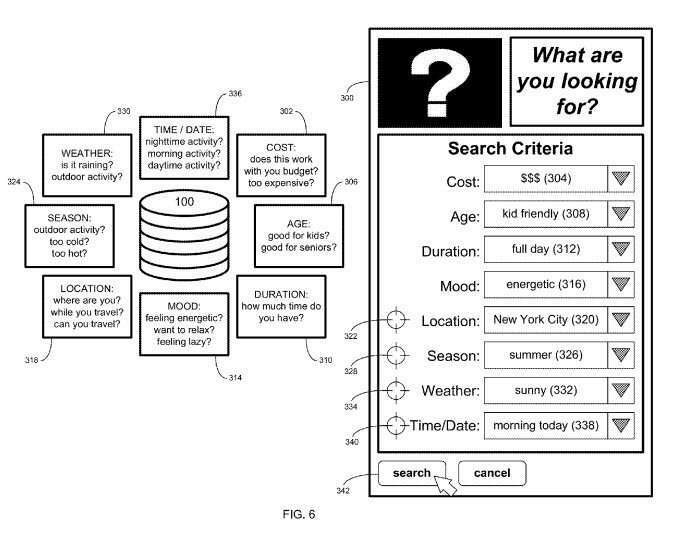 Google published a patent application this week that details the user card interface Google is using for applications such as Google Now. 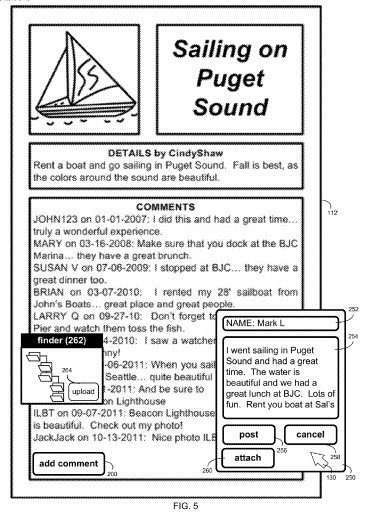 The “invention” described in the patent enables people to share the things they want to experience, or experiences that they have gone through. 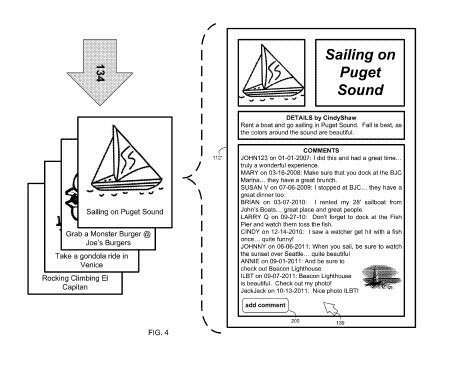 The patent filing is a detailed walkthrough of how a data card interface might work, but it also details a set of social features that are unique and may be engaging enough to be adopted by a wide range of people. 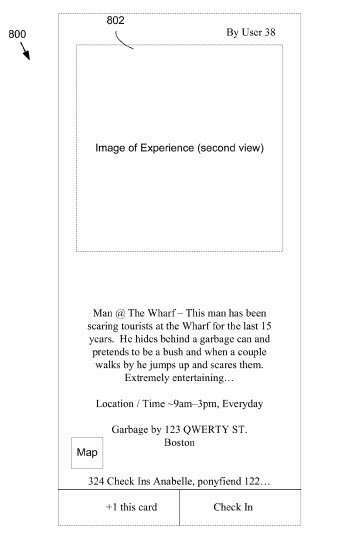 See someone behaving abnormally at a nearby wharf? Share it on an experience card with others who might be within your circles, with an even broader audience, or even the public. Have a desire to eat a gourmet meal and imbibe a bottle of wine in a cafe in Paris? Post the experience, and share it with others. Part bucket list, and part neighborhood gossip board, there are lots of ways to share your experiences, or the things that you want to experience. You can take photos, scrape an adventure from a web URL, or even monitor other people’s experiences through a feed. Bag of money for expensive experiences. Martini glass for an experience involving alcohol/adult beverages. Runner for an experience athletic in nature. Laughing face for a funny/enjoyable/entertaining experience. Knife and fork for an experience involving food. This experience database system allows you to check in on your experiences, or other peoples. Someone wants to eat lobster at a certain waterfront San Francisco seafood restaurant, they can check in on the experience and post a photo from the restaurant and a review. Or someone else who the card was shared with could as well. Experience cards can be searched based upon a number of criteria. 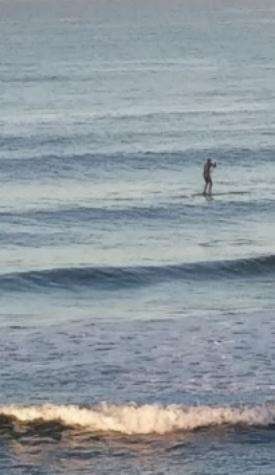 These can include; cost, preferred ages of typical participants, duration of an experience, mood of participants from energetic to relaxed, location, season (skiing in Winter, surfing in summer, etc. ), weather, and time/date. Only accessible to users that are proximate a certain location (within a geo-fence or a predefined distance of the experience defined within the card). This experience database is part todo list, where you can itemize things that you want to do or experience. While you can create an experience, and add it, you can also search through and be involved with other people’s experience cards. You can comment on them, review them, offer suggestions, or share your own experiences. A “generate itinerary” button would allow you to string together a series of experiences, such as on a trip to Washington DC, where you can add a tour of the Whitehouse with a visit to the Washington Memorial, followed by a swing through the National Archives building. This system enables you to schedule events in advance, with discrete dates and locations and activities, such as watching the ball drop on New Year’s Eve in Times Square. You can check in on those events, add details to them over time. The events database might attempt to avoid duplication of events, and may group similar events together. It could also be used as an experience suggestion repository. User commentary concerning a user experience is received and a user experience data card is generated for the user experience based, at least in part, upon the user commentary. The user experience data card is stored, wherein the stored user experience data card corresponds to a first view of the user experience data card and receiving a request for an experience data card from a second user. The user experience data card is provided to the second user at least in part based on the request received from the second user and receiving feedback from the second user concerning the user experience data card. A second view of the user experience data card is generated based, at least in part, upon the feedback from the second user, wherein the second view of the user experience data card is distinct from the first view of the experience data card. Would you share your todo list of things you would like to experience? Or information about things that you’ve experienced? Thanks for sharing this Bill, very interesting read. Since using Glass, I’ve been looking at everything in Google results that fits into the card experience (the deck of cards on a carousel results), I just wish they’d keep it out of the desktop experience. Intriguing. It somehow strikes me as an extension of the concepts of the semantic Web, but for people. Soon we’ll be so busy documenting our lives that we won’t have time to do anything else! Great article, Bill, tat shows how The Internet of Things is becoming an ever closer reality. Who’ll be the first to create a game of Top Trumps with these hover cards, do you think? What a great drinking game: my trip to Paris whoops your jaunt to Blackpool – you lose! Or even the Hover Over Lover Dating Site? Match your personality and experiences with like-minded others? The knowledge graph wants ALL THE DATA. Skynet (oops, I mean Google) are trying to map every facet of the human experience. This looks like it could be a really interesting tool – or another social fad – but ether way the steps Google is making are incredible. I’m with Ana on this one. From a “Personal” perspective – No I wouldn’t share it. From a “Business” perspective – Yes, I would happily share it. It can be a good option, as more your connections will share..more information will reach to us.. But aren’t all posts, updates, tweets, and pins already experiences? It seems that any personal social media (meaning not for business or marketing) already tells and shows what we’re currently doing or what we’re about to do or what we want to do? You’re welcome. I wonder how many people feel the same way. I’m guessing that there are lots of people questioning the same thing. It does seem like Google is now designing for mobile first, and desktop second. I’m not sure that the card interface needs to match the mobile interface that closely, but I can understand why they might want the look and feel of applications they develop to be recognizable across both. It is really interesting watching Google taking steps like these. I’m leaning towards Google putting experience cards out there primarily as a social activity rather than as another way to collect more data, but it is a way of possibly learning about what people really are interested in. The thing I think I find most interesting is the search function to find cards that might be relevant to me (and to others). I think if that works well in helping to find people interested in some of the same experiences, it might work out well. I think this experience database approach makes those experiences more likely to be shared with others. The things you mention are, or can be called, experiences. But setting them up in a way that people can share them in this manner, find them, subscribe to a feed about them, adds some structure to them that’s missing in tweets and blog posts and pins. 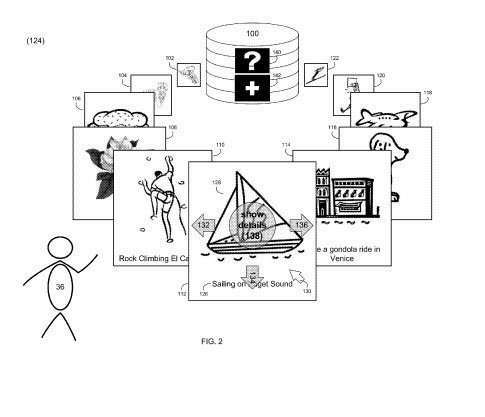 Hi Bill,I like your overall content very well written on Google Patents Social Experience. How endless are the possibilities here? We’re continuously moving towards social activity influencing how we experience life, from purchasing suggestions to recommendations of businesses based on other people’s experiences and so on. It’s all about power users influencing decisions of millions of people and Google is first in the game to capitalize on that. I’m not sure that this particular process favors power users over other users, or extends a strong shadow over recommendations for specific businesses. To me, they are looking for those early adopters who can start filling up these cards in big cities.